A lot of people have stumbled into my blog by searching for info about Cebu Pacific. I’ve made a short list of answers to frequently asked questions (or search phrases/keywords in this case). Answers are based on my experiences with the airline, other traveler’s experiences and from Cebu Pacific’s website. I am in no way affiliated with Cebu Pacific. I am not and have never worked for the airline. How often does Cebu Pacific have seat sales? I don’t know the frequency, but they have one usually near the end of summer (April/May) for flights during the lean season. Your best bet is to sign up for the Cebu Pacific mailing list. They regularly send out notifications if there’s another seat sale. Why aren’t they serving any refreshments onboard? Cebu Pacific is a low cost carrier, meaning that in exchange of your cheap fare, you won’t be getting some of the perks you get from full-service carriers. This means no food or beverages (but available for sale onboard at outrageous prices), no entertainment consoles, non-existent legroom, landing and taking off from budget terminals, strict baggage limits and sometimes non-transferable, non-refundable tickets. I didn’t get my e-mail confirmation, what do I do? Call the hotline (Manila: +63-2-70-20-888, Cebu: +63-32-230-8888). It’s a pain to get through, but it’s necessary to confirm your flight bookings to save you the trouble later on. I remember not getting an e-mail confirmation when I booked online through their website. It was a good thing I thought to print the confirmation in my browser. I never got that confirmation, but the print out I had worked perfectly as our e-ticket as it has the booking reference number, our names and confirmation of payment. How much is the allowed check-in luggage? Cebu Pacific allows for 15 kilos per passenger for both domestic and international flights (except for the Boracay/Caticlan flights, which only allows 10 kilos). In excess of 15 kilos, you have to pay Php34 per kilo for domestic flights. Excess baggage charges vary for international destination, so if you think you’ll be going over the baggage allowance, contact the Cebu Pacific hotline for details. To get an idea how much they charge for excess baggage in international flights, it’s Php300 per kilo for Singapore and Php200 for Hong Kong. Which airport does Cebu Pacific use? UPDATE: Starting July 22, 2008, some of Cebu Pacific’s flights have been transfered to the new Ninoy Aquino International Airport Terminal 3. These flights include flights to and from Caticlan, Naga, Tuguegarao, Laoag and San Jose (Mindoro). Starting August 1, 2008, all of Cebu Pacific flights, both domestic and international will now use NAIA Terminal 3. For more information, please visit the Cebu Pacific website. How much is their Go Fare? Is this a promo fare? 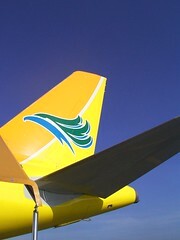 Go Fares are Cebu Pacific’s starting fare for each destination. These are offered year-round, but as the date of departure nears and as seats for each flight fills up, this fare goes up. Domestic Go Fares starts at Php288, while international Go Fares starts at Php1,499. This fare is for one-way travel excluding taxes and surcharges (otherwise interpreted as “hidden charges” ). RELATED: Singapore via Cebu Pacific! - Updated! How much can I expect to pay during their promo? Here’s what you do: check the taxes and surcharges you have to pay for your flight segment (do this by making a test booking. As long as you don’t click on Confirm, you’re not expected to pay for it). Multiply the promo fare by 2 (if flying round trip) then add in the taxes and surcharge. For example, if I was able to avail of the Piso fares to Bohol, I’d be paying around Php 1,800 for a round trip ticket (Php 1,740 for fuel and insurance surcharge). How much do I expect to pay in taxes and surcharges? Fees vary depending on destination. Value Added Tax (VAT) starts at Value Added Tax PHP 238.92, while Fuel and Insurance Surcharge starts at Php 1,400.00 for domestic travel. For international travel, VAT start at Php 557.00, Fuel and Insurance Surcharge starts at Php 1,854.00. What is Cebu Pacific’s international flight schedule? RELATED: What are you doing for New Year’s Eve? This schedule is based on the schedule I got from the Cebu Pacific website. This document is available for download here. Remember, 12:40 am means 40 minutes past midnight, while 12:40 pm means 40 minutes past noon. That’s all I have at the moment. Got more questions or have an answer? Send it my way and let’s share the love. Nina doesn't aim to travel to every country in the world -- she just wants to travel to the places that means the most to her. She started traveling in 2006, and hopes to travel for as long as she can. Her travel blog, Just Wandering won the Best Travel Blog in the 2010 Philippine Blog Awards and in the 2011 Nuffnang Asia Pacific Blog Awards. extended and summer seat sale ng cebu pac today! panu pala pag fortuitious event, at di na talaga pwede lumipad ang plane, nag reresched ba sila ng free? Talaga? Hmmmmmmmmm. Ay teka, wala nga pala akong pera. Haaay. your a grat help thanks alot for the infos! thanks for your immediate responce regarding this matter. Hi Alma! I am not affiliated with Cebu Pacific nor any airline. Cebu Pacific’s website only lists one hotline number. It’s hard to get through talaga minsan due to the number of callers. Good morning i’ll just have a question regarding the baggage limit. I have plan to visit home in Philippines this coming april and i think I’m going to carry luggage at around 35 plus kg. How many kg you allowed to check in?If i exist how much i pay for about i have 35 kg luggage? My flight is from Singapore to Manila and from Manila to Cagayan De Oro it’s a connecting flight. Hope you can help my little bit question about my flight… Please email me back in my email add. Thank you very much.I appreciate your good services to us… God bless…. Hi nina! ask q lang qng hanggang ngyon b 20 kilos parin ung allowed s cebu pacific tapos 7 kilos ung sa hand carry. tnx! Hello Bernadette! As far as I know, Cebu Pacific hasn’t changed their policy. So yes, it’s still 20 kilos for checked baggage, 7 kilos for hand carry. Have a safe trip! Hi Ahnne! The flights transfered to NAIA 3 on July 22 were the flights Caticlan, Naga, San Jose, Tuguegarao and Laoag. I hear that the rest of the flights are going to be transfered on August 1 from the old terminal to the new. It’s best to check the Cebu Pacific website for confirmation. Would you know of Cebu Pacific’s refund policy? card hasn’t been refunded yet..
Any tips/suggestions on how to go about this? Would appreciate a reply on my email..
Do you know where I can get an EMIS form that is required for pregnant women flying? Their website does not have any information and I cannot get through to the hotline. Thanks. your blog is really helpful thanks, keep it up! hello! I would like to ask for your assistance regarding the problem I encountered with transacting with Cebu Pacific. I am a connected with a government agency and I am tasked to make a follow-up regarding our request for a Written Details of Charges which were deducted from these 3 tickets which were cancelled when 3 of our officemates didn’t go with us when we had our official travel to Cebu City last March 2009. This written details of charges are needed for the liquidation of our official travel and our Commission on Audit auditor already made a follow-up on this documents. Please help us facilitate this request. I already made a request through Cebu Pacific’s Call center (02) 7020222 and (032) 2308888 and made follow-ups but up to this date, I haven’t received any positive response to our request. Yesterday, I asked for their Accounting Department’s contact number hoping they can facilitate my request but such number (02) 852-2328 won’t even answer my calls and just hung up. It seems that when facilitating customer’s requests, they act slowly or won’t give a damn. But when it comes to collecting fees and payments, they act speedily. Also, the refunds expected to be processed 30-45 days haven’t been credited back to my credit card. Hoping you could help in this request. These are the confirmation numbers of the cancelled tickets: P8TCRG, L22RRL, and HEYWNR. Thank you so much. I hope I can receive a positive response on my email address. there is no downloadable form in there website. hi!.. siper problematic ako sa excess baggage ko.. although ayaw ko dalhin ang sandamukal kong gamit eh kailangan… good thing i have the answersa problem… php 34 per kg as stated sa site na to and excess sa allowed wt for the baggage.. pero 15kgs lang ba talga allowed for 1 seatna cguro ang value ng excess luggage ko..
Cebu Pacific is horrible! You get less than what you pay for in terms of service and personal relations. My family has been a costumer for Cebu Pacific for 5 years and from the second year up to this year we experienced ridiculous treatment from Cebu Pacific. On the second year we purchased Cebu Pacific a crew member (stewardess) shoved our fragile baggage into the compartment when we asked her to gently lift it into the compartment. When we got to our destination, the “CAKE” was damaged extensively at one side. On the second year of our flight with Cebu Pacific my mother was charged extra for purchasing tickets on a date which was booked wrongly by the staff at one of their offices at Makati. So instead of saving money, she spent more than what she could have spent for regular priced flights. On the third year we purchased tickets from Cebu Pacific, we had trouble getting back to Manila from the province because the airplane that Cebu Pacific sent for us was a small one and could not accommodate all passengers. There is absolutely no sense in this! We had to demand that they give us, and many other affected passengers, the flight that we paid for because we had important commitments the next morning but only my companion and I received seats. The rest of the passengers, around twenty or more, were left to suffer the irresponsibility of Cebu Pacific. Finally, just this December 22, 2009 I witnessed corruption amongst members of their “Security”, mainly involving the “Lady Security Head”. I had witnessed the “lady security head” being paid a roll of P100 bills by an “Asian Nationality” just so he could pass through the check point and take his “unsealed alcoholic beverage” into the airplane. One of them even almost dragged my mother by the arm forcing us to go to the office to report what I saw . Because of such harassment I lost my temper and screamed at the security to let go of my mother telling them “How dare you touch my mother in the arm?” We warned them that we will report this case immediately in our own means and that any harassment will never be tolerated. This is why I have never appreciated Cebu Pacific. It is simply fooling people by promoting cheap fares at the expense of absurdity! Four offenses in a row is too much! Does anybody know where to request for assistance for luggage that was left in the airport luggage belt? Should I call CebuPac or Naia3? Anybody with the same experience? hi! i wanna ask about my international ticket. quite confusing kasi. okay lang ba na mali ang spelling ng name and surname sa ticket. sabi kasi ng pinag book ko ng ticket okay lang daw yun..accepted ba yun? then kahit sang booking office ba pwede pa confirm ang ticket.??? thanks for the response. naka usap ko yung pinag kunan ko ng international ticket ko. sabi sakin kahit di na palitan yung ticket need lang naman yung confirmation number pero sa system daw nila eh naka “noted” na daw po yun..is that possible??? may the good forces be with you teh. patience.. ? as expected Nina! alam mu na! haha very hlepful! it shows sa dame ng comments! good day!!! tanong ko lang po… ang mama ko galing london pauwi sa pinas…sa NAIA terminal 1 cya mag arrive at 9:30 am….saan po ang terminal ng cebu pacific from manila to gensan???? I think you can, but you’d have to pay an additional Php1,000 for international flights, Php500 for domestic. I’m not really sure on the price though, but it should be around that amount. You can pre-pay it now, just login to Cebu Pacific’s site and manage your booking. This is also something that made me say “HUH?” I always travel with PAL and the first time I travelled with Cebu Pacific, everything was really different. Nevertheless, I cannot do anything if that’s their company’s way of giving service to their clients. i have this problem about cebu Pac. kasi I book a flight dating sept 15 2012, but then i rebooked it to sept 13 2012 and choose lbc to pay for it pero pag dating ko sa lbc sabi expired nadaw mag rebook daw ako ulit.. pero nung nag rebook aq mga 2 days after nandoon parin yung change flight fee 744 sa first rebooking ko.. pag nagpa rebook aq ulit mag pa pile up xa.. magiging 1500 bakit ganun? does children still needs ID when travelling domestic, with his parents? Hi do you have an idea why everymonday no one answers my call thru costumer service? I solemnly swear that I will never sell your email address, nor will I send you spam. A verification email will be sent to your inbox. Please verify your subscription to get the latest posts!